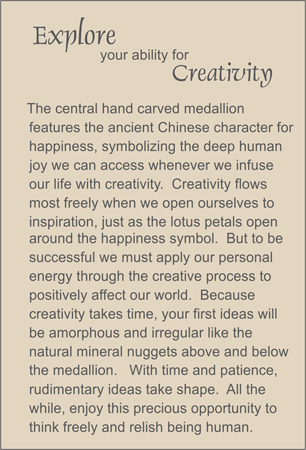 MEDALLION: Taupe-colored serpentine hand-carved medallion representing the open petals of a lotus flower surrounding a central happiness symbol. ACCENTS: Amethyst nuggets and small quartz crystal ellipses. COMMENTS: You are creative, no matter what you think. This bead will remind you to let your creative side show. See an Asian design for Creativity by scrolling down.